I reached out to Chef Todd Stein at The Bristol (hands down favourite restaurant in my neighbourhood) for a contribution to post here and when he sent me his soup recipe I hiccuped with joy. My go to starter (appetizer) recipe for dinner parties in London when 20 something was Celeriac (Celery Root) and Stilton Soup. You say tomato, I say tomato…same thing right? Celeriac has it’s own inherent creaminess when cooked right and the subtle herbaceous, citrus, but not quite citrus note nibbles it’s alluring way into being a deliciously enigmatic and delicate root veg despite it’s gnarly, obstructive and hardy appearance. I think it serves a good Autumnal table in all manner of dishes and can be converted to Summer in a splendid fashion. Persevere with it and take notes from Chef Stein recipe below. To all your good health! 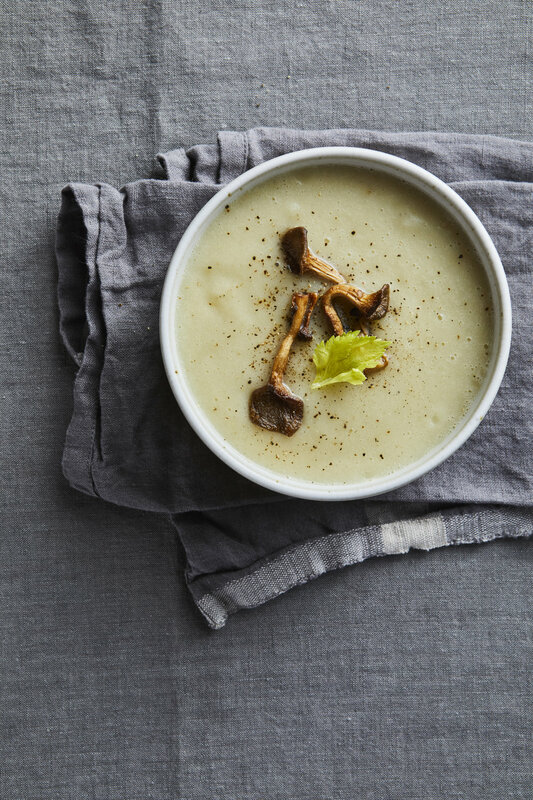 Simple and delicious, I have provided a Celery Root Soup recipe that is easy to make at home and perfect for the colder months. When I was a kid, I was enamored with Campbell's soup, particularly for breakfast. One of my absolute favorites was Cream of Celery soup; I just loved the flavor and richness of the celery and the cream. As I started my culinary career at a young age, I began to dislike cream-based soups as my palette changed. But still the idea of a celery soup, and perhaps something a little healthier, appealed to me as a cook. I was turned on to the idea of using potato as a thickener, instead of cream or otherwise, and you get the same effect in my opinion! I love adding oyster mushrooms and onions to my own version to keep it light, although any number of vegetables and chicken would be a good addition as well. 1) In a large pot, heat olive oil and add celery, onion, celery leaves, and garlic, and sweat (do not brown) about ten minutes on medium heat. 2) Add potato and water. 3) Bring to a boil and reduce heat. 4) Cook about 40 minutes or until vegetables are soft. 5) Puree in blender until smooth, add more water if necessary. 1) Put mushrooms in a soup bowl and pour hot soup over the top.